offers Hawaiian Cultural events to augment your experience of Aloha. A true sense of welcome requires us to acknowledge our shared relationships, in a manner that is genuine and inclusive. By defining the ways we are interconnected, we become invested in the wellbeing of our guests. Kāheahea encourages us to turn towards each other, looking again and again for ways to provide service before it is even asked. In the hula community, a sunrise hiʻuwai ceremony often precedes graduations and other significant events. Kumu Mālia has lead consistent quarterly hiʻuwai since 2003, observing every solstice and equinox. Following a pre-dawn meditation, participants gather to chant awake the sun and then go into the water to ceremonially cleanse themselves. Waolehua is the domain of lehua blossoms. It is a dedicated space for women created near each new moon. These ongoing womenʻs gatherings seek to provide a safe space for uplifting dialogue on any number of topics pertinent to the female experience. Female identifying individuals are warmly welcomed. Kumu Maliaʻs uplifting and engaging style welcomes even the littlest dancers into the world of hula. Classes include seated hula for infants and toddlers together with their caregivers, as well as ongoing classes for elementary aged keiki. Children love lomilomi as well as grownups and Kumu Mālia has provided lessons for keiki and their parents to work on each other. Waterfall Lei-making outing: If you have ever dreamed of bathing in a mountain pool under a cascading waterfall in Hawai’i, here is your opportunity! Imagine yourself coming upon a beautiful waterfall and mountain pool as you walk through a lush valley. Add the joy of learning a hula dance and making a beautiful lei of native plant materials…what a day! 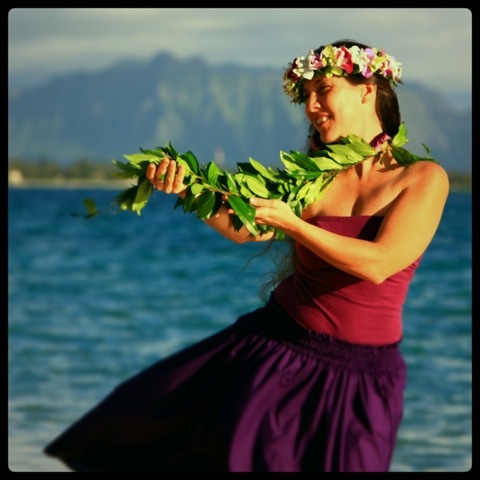 Join traditional Hawaiian hula teacher Mālia Helelā for a hi’uwai: ocean cleansing. Meet before dawn with Mālia, her students, friends and family members for a joyful occasion. This is your opportunity to symbolically release into the sea anything you are carrying which does not serve you. The water is always a delight! After the beach meditation and ocean cleansing, enjoy a healthy breakfast. Discover Honolulu’s past with traditionally trained Kumu Hula, Malia Helela, on a guided tour of historically and spiritually significant landmarks and sacred sites. The connections to traditional healing practices will be used as a theme for the walk. Stories will frame the talk in true Hawaiian fashion. Includes insights into Hawaiian history, nature, language and culture. If you have ever dreamed of bathing in a mountain pool under a cascading waterfall in Hawai’i, here is your opportunity! Imagine yourself coming upon a beautiful waterfall and mountain pool as you walk through a lush valley. Add the joy of learning a hula dance and making a beautiful lei of native plant materials…what a day! Experience a uniquely Hawaiian perspective to visiting sacred spaces with native Hawaiian practitioner Malia Helela. Learn hula and flower lei making at beautiful Waimea Valley on O’ahu’s North Shore! Learn to appreciate aspects of nature that you might never notice on your own. See Hawaii with new eyes. The day begins with making our first lei with a native ti leaf. We offer this lei at a Hawaiian place of worship, Hale o Lono Heiau, asking permission to enter the valley. A sense of welcome arises from creating a personal relationship with a place. Carry that perspective forward in your life. A lei symbolizes life, with beautiful memories and loved ones strung together like flowers in a lei. Weaving our way through Waimea Valley, a traditional home of priests in ancient times, we honor our role as the string that holds the beautiful moments of our lives together. At the boundary between common and priestly land, Malia will offer a chant in Hawaiian to state our peaceful intentions. On the Great Lawn, we will settle in for a morning of instruction. As an experienced and encouraging kumu hula (hula teacher), Malia will teach even people with two left feet to dance with confidence and grace. You will dance holding the lei kui (lei of flowers) that you strung with your own hands. As part of our closing ceremony, we will gather in the face of Waimea Falls to weave a single lei hipu’u as an offering of our thanks. Any interested person is welcome to join Kumu Malia in swimming the lei out to the waterfall. Safety is assured with the presence of City & County Lifeguards. Activities include lei making, hula lesson, lecture, ¾ mile walk to Waimea Falls, gift and closing ceremony. After the workshop, participants are welcome to keep their flower lei or release them into the ocean.